Hi loves, I received my coupon code for the Sephora VIB sale which is coming up very soon! It is for 15% off your whole entire purchase which is seriously amazing. I thought I would share with you some items that I have my eye on for during the sale. When it comes to the VIB sale I like to buy products that I can't find at Ulta, only because Ulta tends to have more sales and promotions throughout the year compared to Sephora. So for the VIB sale I stick strictly to brands you can only find at Sephora. So I thought it would be fun to share with you what I have my eye on! The sale will begin on April 18th for for Rouge Members and will go until April 24th. And for the VIB members it will start on April 19th and will also go until April 24th. Sol de Janeiro Brazilian Crush Body Fragrance Mist $32.00- I have been in love with the bum bum cream and the smell is seriously to die for. So I am super excited they came out with a fragrance mist! I think the scent is perfect for Spring and Summer so this is one item at the top of my wish list. Moroccanoil Dry Shampoo Dark Tones $26.00- I am currently out of my Batiste dry shampoo for dark hair, so I really wanted to try something a little different. While browsing the Sephora website I noticed that Moroccanoil has a dry shampoo for dark hair! So I thought it would be a perfect one to try out! 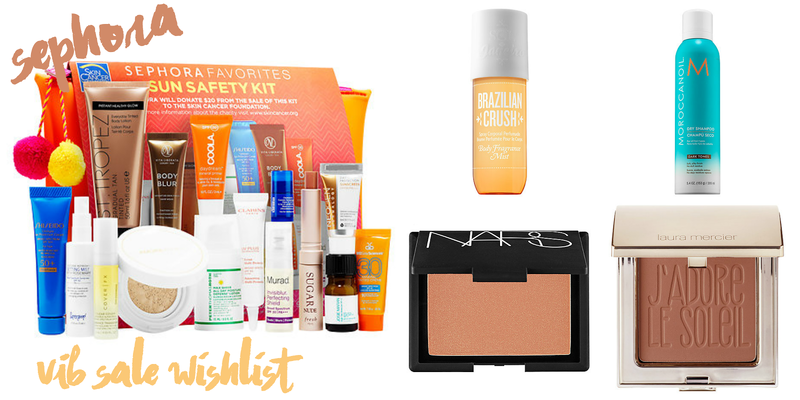 Sephora Favorites Sun Safety Kit $32.00- I am a huge fan of the favorites kits by Sephora and this one looks like an amazing deal. It comes with 15 different products that are perfect for Summer. It comes with sunscreen, safe self-tanning products and bronzing must haves. It also comes with a cute little bag all for $32.00 and its a $132.00 value! Such a steal! NARS Madly Blush $30.00- I know Ulta had recently started caring NARS but they do not carry every single product. I love NARS blushes and I have had my eye on Madly for the longest time! I think its time for me to finally purchase it! Laura Mercier J'adora Le Soleil Matte Veil Powder $40.00- I do not own a lot of products by Laura Mercier but looking at the newly releases on Sephora's website, I fell in love with the look of this bronzer! It looks so pretty and I love the packaging! Let me know in the comments below what is on your current wishlist for the sale! So far this is the top 5 items I want and I am sure once the sale is here, I will find even more items I need/want.